This week, Labour party members and affiliated supporters have been receiving their ballot papers; as a result, there has been last minute campaigns and continued fighting talk over who is best to lead the party and win the election in 2020. During the campaign period, Jeremy Corbyn has received a lot of support from young people as well as the support from older voters. However, the surge his campaign has created has also received criticism from Blairites and those who sit on the right side of the political spectrum. All this back and forth between the ‘lefties’ and the ‘right-left’ have caused me to consider that actually, the momentum Tony Blair received can actually be compared to the current Corbynmania. Maybe this explains why the other contenders feel threatened by this surge of support. Food for thought eh? Surely the way Corbyn’s campaign is engaging young people into the political debate is a good thing? Surely bringing something that is different to the status quo opens up the electorates eyes and ears? The fact that so many people across the country support Jeremy Corbyn and what he hopes to offer if he wins the leadership contest proves the electorate is done with ‘New Labour’. I just don’t understand why so many New Labour supporters and right wing media are smearing his name and doubting his ability to move the party forward. Surely the amount of young people he’s been able to engage and the debates he’s opening speaks for itself? 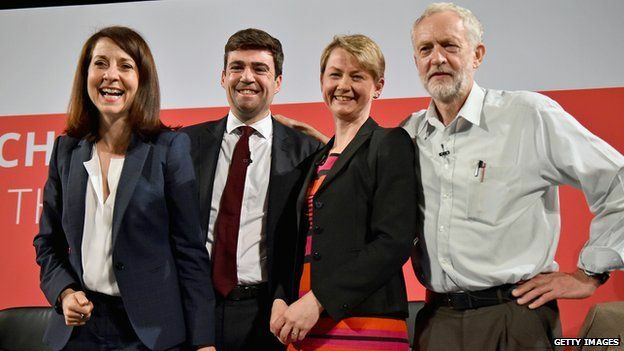 Rather than circumnavigating over the old dilemma of whether socialism is dead, maybe we should be asking ourselves whether New Labour is dead. It certainly may be the beginning of the end of the Thatcher-inspired branch of socialism as in recent weeks, we saw Blair and Brown trying to hold on to their creation, urging supporters to vote for someone other than Corbyn. Jeremy is the only contesting leader that is providing an alternative, the only one who seems to be listening to what Labour supporters actually want, rather than making the choices and decisions for us. Let’s think about this in another light – why aren’t the media smearing the names of the other candidates standing for the leadership? It’s not because the other leaders haven’t got dirt of their own that’s for sure. Jeremy isn’t pro New Labour. Never has been so he’s seen as the slayer of something these Blairites are trying to hold on to. New Labour had its moment but the moment Tony Blair decided to go to Iraq, it went into cardiac arrest. New Labour is now in a coma, and if Corbyn is elected in a few weeks time, it’ll surely be dead. In a way, i kind of feel sorry for those at the top of the party who have been trying to preserve the foundations of New Labour. I think because it’s been a custom of the party for so long, people who support that branch of socialism have become to fear change. But it’s ironic isn’t it? I mean you hear from politicians that we need to be pragmatic as well as progressive but Jeremy Corbyn enters the contest to do just that and the media and those who oppose him are first to criticise. I guess its the fear talking within them. It seems people across the country are pleading for an alternative, a party that actually stands for something, a purpose other than solely seeking election victory. You see, because before you can even set a goal, you need to grasp what your purpose is, what you hope to achieve and how you will do so. In order to win the hearts of the people, it doesn’t help by smearing someone’s name in dirt which is what i admire most about Jeremy Corbyn. It must be very hard trying to run a campaign and gain the support of people (hasn’t failed there) when the media and other fellow Labour Party members keep using your views and portraying them in a negative light. Corbyn’s stance on foreign policy and international relations has also been highlighted and debated. From calling Hamas ‘friends’ to his connections with controversial figures in the Palestinian movement. The backlash against Corbyn’s campaign has gone as far as to base his credibility as leader on the people he knows. Firstly, i’m sure many of us know people with radical views who we talk to and probably consider as our friends, doesn’t mean we hold the same view as them. Secondly, how do we ever expect to achieve peace if we don’t speak to our enemies?! Peace isn’t achieved through endless wars and terror attacks, that’s for sure. This nature of not negotiating with the other side is completely ridiculous. Everyone has to be part of the peace process, including those we consider as the bad guys. That’s how we come to common ground. Wake up people!!! Rather than dig up dirt on a genuine candidate who speaks his mind regardless of instructions by party whips and so on, why don’t we listen and partake in this new, open and honest politics Corbyn has ignited? As someone who has worked alongside Jeremy Corbyn many a times, i know he’ll offer something different, something we’ve been wanting for a very long time. A movement. Corbyn’s politics hasn’t been the norm for over 20 years and that my friends is the real fear amongst anti-Corbynites. Last Friday (25th July), opposition leader, Ed Miliband, held a Labour party conference ahead of next year’s general election. One of the topics discussed was people’s position on him being prime minister. If you’re a regular viewer of Prime Minister’s Question Time, you will know that David Cameron is never too shy to attack Mr Miliband on his leadership abilities. When Ed decided to confront this issue at his conference, he stated “big ideas and principles are more important than image and Labour had the right policies on dealing with “the cost of living crisis”. My question is: Does presentation REALLY take priority over policies? It has been evident in the past with previous PM’s such as Tony Blair, who gained a massive landslide in the 1997 general election and Gordon Brown who had less charisma and lost the 2010 general election to Cameron. But should this take sole priority in today’s politics? Shouldn’t we be more concerned about our housing crisis or the lack of employment opportunities for young people and the long-term unemployed alike? Even a former Tory cabinet minister has cautioned Mr Cameron and his fellow Tories to stop taunting Ed Miliband, arguing if he [David Cameron] fails to treat Mr Miliband with respect, the party could lose respect from their own voters. But this ‘lack of respect’ goes further than the Tories – even internal Labour party members and supporters have mentioned their lack of confidence in the Labour leader. Many within the party fear that the constant negativity from the conservatives could deplete their chances of becoming the governing party. The debate over the two P’s (Policies v Presentation) caused me to wonder why the election of Ed Miliband as party leader in the first place? I mean, if i’m being biased here, i always preferred his brother David as party leader. But then i asked myself, aren’t i favouring presentation over policy? You see, David Miliband is charismatic, better looking and a better speaker. But would he have introduced policies right for Britain? Being biased, undoubtedly. How can i be so sure i hear you ask? Well, i can’t, but i hold on to some sort of hope. Just stay with me here. The point i’m trying to make is that maybe we’re so consumed by image, which goes beyond politics itself, that we fail to acknowledge what’s important; their policies and beliefs that will influence everything we do as a nation. Another issue which was raised in the Labour conference was political transparency and involvement. What do i mean? Well, in simple words, public involvement in PMQs which takes place every Wednesday in Westminster. Ed Miliband believes it would “let the public into our politics” and “change our political culture”. Of course a political maniac like me, it’s fab news, but how easy would it be to introduce? There has also been some debate amongst voters who say the public PMQ should not only be held in London, creating concern in terms of accessibility. Would this make our government more transparent and accountable? Who knows, but it isn’t a bad idea Ed.